A contraction in German manufacturing that has sent investors fleeing for safe-haven assets is proving deeper than initially anticipated. IHS Markit’s Purchasing Managers’ Index for the sector slipped to 44.1 in March, worse than a flash reading of 44.7 that was already well below economist estimates. With sentiment at Asian factories stabilizing, German bonds fell, pushing the yield on 10-year securities up 3 basis points to minus 0.04 percent at 9:34 a.m. Frankfurt time. 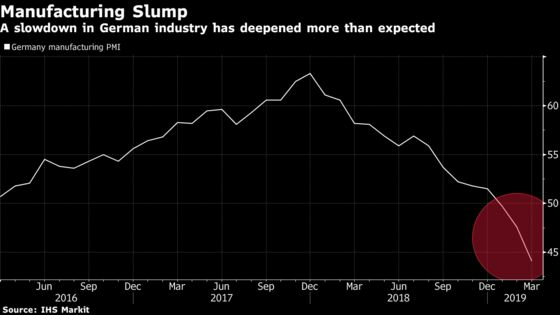 Germany has been at the crux of a global manufacturing slump fueled by trade uncertainty and weakening demand. Orders and export sales are now falling at the fastest pace since the financial crisis as backlogs extend their decline. French manufacturing also shrank more than expected -- the PMI there was revised down to 49.7. A reading below 50 signals contraction. With industry in the euro area’s two largest economies losing momentum, prospects for the 19-nation region are bleak. The yield on German 10-year bonds, a European benchmark, is trading below zero percent for first time since 2016, and officials at the European Central Bank are discussing measures that could help them maintain their ultra-accommodative policy for longer and even loosen it further. In contrast with the country’s otherwise robust labor market, manufacturers cut jobs for the first time in three years, according to the report, with a number of firms indicating that some temporary contracts weren’t being renewed.